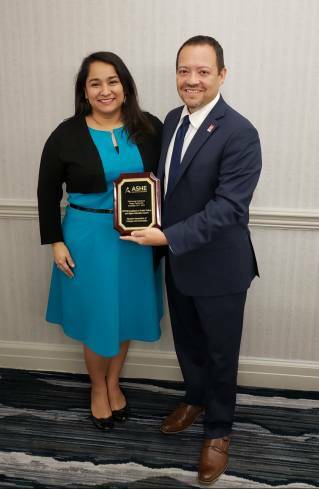 The Hispanic Association of Colleges and Universities received the 2018 CPPHE Excellence in Public Policy in Higher Education Award on Nov. 14, 2018, at the Council for Public Policy in Higher Education pre-conference event held at the Association for the Study of Higher Education Annual Conference in Tampa, Fla. The award was accepted by David Ortiz, Ph.D., executive director for policy analysis and information at HACU. The award recognizes excellence in work at the nexus of academic scholarship and policy practice in the field of public policy and higher education. The ASHE-CPPHE preconference event is designed to explore the processes and impacts of significant public policy issues affecting higher education in the U.S. at federal, state or local levels. The preconference event also examines the role of higher education research in informing decision-making in the public policy arena.